Paula becomes a TV SUP idol at the ASM operation at Matheson Hammock. Sounds like another shoot is on this coming Saturday. I think I may have caught some preparation work two weekends ago. Well, Laird is standing, but in this case on a short board. Talk about poetry in motion thought, this guy can surf! Well, it isn't standup, although you do need to standup at some point. It's skiing, with poles and everything, this difference is it is in water and at Jaws in Maui. Chuck Patterson takes us on an intriguing ride. Wonder what size ski pole bails he uses? Love the snow in the mountains, Chucks run at Jaws looks great too! I don't know if you should run if you see one of these or change breakfast cereals. "Top maui paddlers run the north shore of Maui in open ocean stand-up boards gliding on open ocean wind swells." A look at a classic Maui Standup downwinder. It sounds like something from a post World War II cargo cult: Three decades ago, an Australian pilot leaves a surfboard in a remote village in Papua New Guinea called Vanimo. The village, which lacks rudimentary facilities like electricity or running water, becomes surf crazy. Fast forward to today, when Papua New Guinea is holding it first national championship, with the winner being given the opportunity to travel to Australia and train with professional surfers." Check out http://www.watermonkeyshop.com for more blog posts and video! Last week I made a 3 hour drive with a friend to get some waves on the east coast. Our first stop was Playa Linda on Cape Canaveral. I am proud to say that I am the last soul to have SUP surfed in front of the space shuttle Endeavor. This is the legend of the last cosmo SUP surfer and I'm sticking to it! Playa Linda closes a few days before any launch and we were able to squeeze in a session before it closed for the Endeavor's last lift-off early Monday morning. As I was surfing I couldn't help but think of how cool it is to surf in front of a live space shuttle getting ready to launch into orbit only a few days later. I'm pretty sure there is nowhere else on this planet that this can be done. However, I would not doubt that somewhere on another planet an intelligent being is surfing star-dusted barreling waves on his surfing space ship. I'll be sure to share more of my intergalactic surf fantasy another time. For now, check out the video of my rocket fueled east coast surf trip! Now, did he nail the pigs in the bush or while swimming laps? Hard to say. We can hope the guy never paddles across making it as far at the Exumas in the Bahamas. This friendly ocean-going swine might well be for the knackers if so. Swim fast guys, never know what might float up on you! Standup in a remarkable setting off Columbia and in the company of a breaching whale! 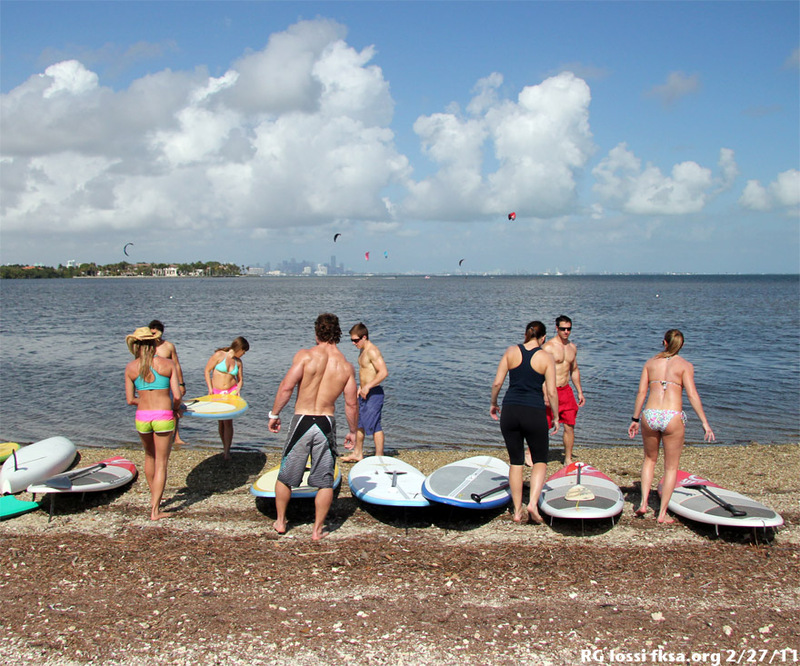 Great shots from Blueline Standup Paddle Surf. and just to show they aren't biased towards warm destinations alone, here is a great video of paddling in Iceland! Last edited by RickI; 08-30-2011 at 09:04 AM.